The 3 Drawer Vanity Chest is a perfect accessory for the lady who wishes to have that immaculate home. An ideal, trendy, multipurpose chest to keep all your ever growing collection of feminine knickknacks such as cosmetics, brushes and applicators, jewelry, hair clips, hair bands, safety pins, sewing kit, and all that you can think of. Give your kids a couple of these multipurpose chests to store their stationary, craft, and hobby supplies, such as scissors, glue, paper pins, staplers, punch, pens, pencils, erasers, toys, games etc. Your little girl can also store her own collection of vanity items, doll stuff, her hair bands, pins, clips et al. Keep these cubes outside on any counter top or inside your closet. They can also be stacked one on top of the other to save space. 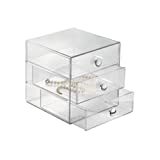 Made of high quality, durable plastic, this cube has three smooth sliding drawers with chrome knobs for easy open and shut action. The transparent view allows one to look at the inner contents of the cube and retrieve what one wants easily and conveniently.